Rock Class 101 began as an idea in the Summer of 2013. At this point in my life, I had graduated from music school 2 years earlier and was currently completing my first year of corporate. I was employed as an Admissions Recruiter for a For-Profit college. You know, one of those school's that charge ridiculous amounts of money for a degree. Essentially, I was selling a product I didn't believe in to students who weren't aware of cheaper alternatives (i.e. Community College). Ethically, this was depressing to me. I was working to make the greedy corporate wigs richer and putting students into too much debt, all while I rotted away in a cube. This was the start of my escape. My whole life I knew music was what I wanted to do. I just wasn't sure what it was that I would do. After all, music was the one thing in my life that never got old, that I never quit, that never stopped being exciting. One night I met up with my friend, Dan Holloway. With the help of his kids, they launched a very successful online lessons site for fingerstyle guitar in 2009. I was amazed by how many members he had, how he was able to focus solely on his business, and how he enjoyed what he did! That night a dream of mine began. I had finally realized what I was meant to do. A lessons site provides a way for me to compose, perform, and teach. 3 aspects of musicianship that defined who I wanted to be and what I wanted to do. So, I handed in my 2 weeks notice to corporate and launched the site as AndrewHardel.com in October of 2013. Fast forward a year. In the summer of 2014, I met a young girl who wanted to take ukulele lessons. Her sister was taking guitar lessons at the store I teach at, but she wanted to play something different. So, I bought my first ukulele. I figured, if she quits after a month, at least I'll make enough to cover the cost of a cheap uke. Well, she didn't quit, she actually still takes lessons with me! But something else happened too. I really enjoyed playing ukulele! About a month later, I thought it would be fun to write an arrangement for 'Here Comes the Sun' and post it on the site as a freebie. So, I did! But, I could have never imagined what happened next... People were watching and learning the arrangement; and not just a few people... a lot of people! 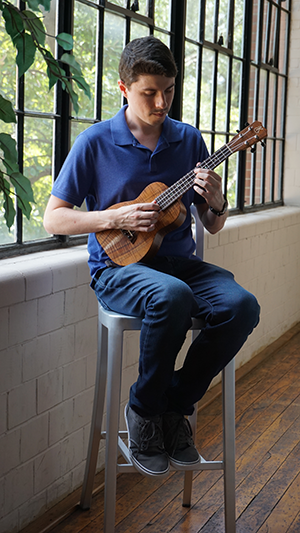 A few months down the line, I launched the ukulele lessons section for the site. With just a few songs up, we had multiple members in the first month. After over a year of trying, and trying, and trying... I had finally seen success. I was ecstatic! In January 2015, the site transitioned to 100% ukulele lessons. Fast forward to today, the community at Rock Class 101 continues to grow everyday. It makes me so happy to be able to help so many people learn how to play ukulele around the world. There are currently over 300 lessons (which include complete tabs and typically 30-45 minutes of video content per lesson) with new arrangements added every Friday. This is only possible because of your support. Thank you so much for believing in this site and helping to make my dream come true. If you ever have any questions about the site, or just want to say hi, you can contact me directly at: Andrew@RockClass101.com. Andrew is humbly honored to be an official artist of Kanile'a Ukulele. Stephen is a multi-instrumentalist songwriter with an affinity for the Bass and the Ukulele. He has taught lessons for over 10 years, and met Andrew early on while teaching at the same store across the hall. Stephen currently teaches at The Music Studio at Vinings in addition to working with Andrew on Rock Class 101. In 2017, Stephen released his debut album, “Transitions.” This collection of original songs features Stephen on Bass, Piano, and Ukulele. The album tells a mostly instrumental story of the ups and downs of city life. 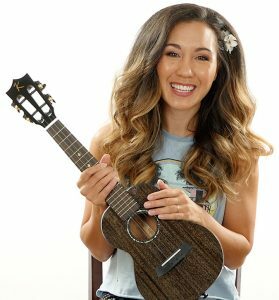 Hi, my name is Katie DeNure, and I'm a ukulele, guitar, and voice teacher. I started a YouTube channel in July of 2016, and my channel has recently reached an amazing milestone of 100,000 subscribers. As a little girl, I was constantly singing, and life was one big musical to me. It got to the point that my desperate parents had to impose "no singing" rules on me. Once I started to learn how to play the piano, I felt a drive to learn as many instruments as I possibly could. I became very ill at the age of 17, and I completely lost my voice; however, it turned out to be a blessing in disguise. My speech pathologist assigned me classical voice training as part of my rehabilitation, and an even stronger voice emerged from that painful time. With new found ability and new found purpose, I vowed that I would sing and play to the glory of God because he showed me that beauty can come from ashes. Before I sang and played for my own attention. Now I sing and play because music can bind up the broken hearted and set the captive free. 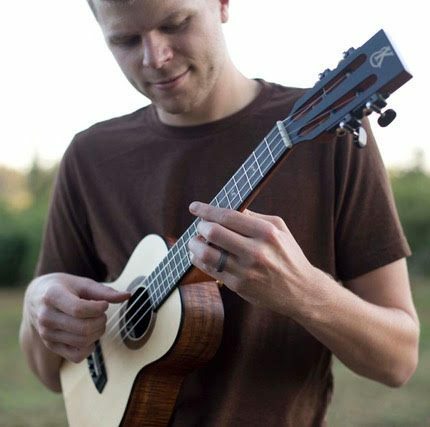 Born and raised in Seattle, Matt has been in love with the ukulele since his grandfather taught him his first chord. 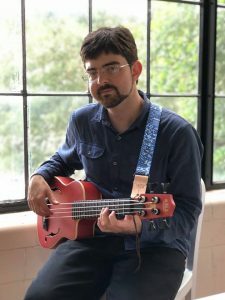 A two time Ukulele Underground Undie Award Winner, Matt is known for his virtuosity as an instrumentalist with the ukulele and is considered to be one of the premier “up and coming” artists in a new generation of ukulele players. While the ukulele is typically associated with it’s Hawaiian roots, Matt is taking the instrument in new directions. Instrumental covers of some of rock’s greatest pieces including Behind Blue Eyes (The Who), Hey Jude (The Beatles), Livin’ on a Prayer (Bon Jovi), Kids (MGMT) showcase Matt’s unique approach to the undersized instrument. He’s even had a rendition of the NFL on Fox Theme featured on Fox Sports Live! 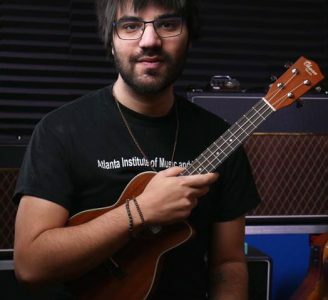 While his abilities as an ukulele performer are well known, his unique passion for teaching is what has garnered the most attention. He’s been featured in a front page article in the New York times for his online teaching practice. Matt gives one-on-one, as well as group ukulele lessons online from his home in Seattle. Hi everyone! 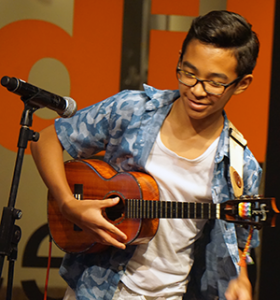 I am Evan J De Silva, a proud and passionate ukulele player! The truth is I was initially interested in a guitar instead (at 8 years old in late 2013). However, my dad refused to get me a guitar because he said my fingers were too small. It made me feel very heartbroken. After several trips to the mall, my eyes caught sight of what looked like tiny guitars, which I then learned was called the ukulele! After some persistence, my dad finally said yes and got me my first ukulele. It was one of my happiest days ever. My dad taught me my first chords and the rest was history. Not having any formal ukulele classes, I started watching YouTube videos online. Today I can play more complicated songs, but I still remember the first song I played was a simple Christmas song, ‘Jingle Bells’. I was over the moon to have finally mastered my first song. The underrated ukulele can sound just as amazing as other popular instruments. I have never looked back since becoming a ukulele player. In 2018, I was the first to audition at a music school with the ukulele alone! Not only did I get in, but I received a scholarship from the music school as well. My name is AJ Hirsch, and I am an Atlanta based musician, composer, and instructor. Music has been a passion of mine for as long as I can remember listening to classic rock and blues music. In 2014, I graduated from the Atlanta Institute of Music and have since been performing, teaching, and composing original music for guitar, ukulele, piano, and lap steel.